I was led to share a glorious happening in our geographical area. Since Brenda knew the exact details, I called her to the platform. She was almost out on her feet from the glory of the Lord. As she told it, she could barely speak. Just in a whisper. I heard her and repeated it again for the congregation. Later she told me that the cloud of glory was so thick she could barely see anything in it. She looked toward Pastor Terri Pearsons and could only make out her form; she could not see her face. Expect the Glory! Yield to the Glory! It’s time for the Glory!!! I really hadn’t paid much attention to this eclipse. I had followed closely the eclipses that occurred on the Jewish moeds in 2015, but nothing had drawn my attention to this one. Until—I talked with Pastor Lynne Hammond the week before. She’d had a visitation of the Lord that lasted 3 hours. So many things came to her in the night vision. One of them was she saw the eclipse. Now she was just sure it had already occurred. She herself walked in a dimension in the vision. And she saw that with the eclipse a “shift” would occur for all of us. I could hardly convince her that the eclipse hadn’t happened yet. So, after our talk, I went online to look at the particulars the scientific sources were saying about the eclipse. There I saw how uniquely spectacular the appearance of the moon would be. I know that eclipses are scientifically predictable for veritable eons. Many probably have no prophetic significance. Yet, it was the Creator who set their predictability. So I checked to see what the rabbis might be saying. Some I checked were saying it was a portent of the Gog-Magog war. Well, I can see three Gog-Magog wars in the Scripture, but I knew the one they were talking about was Ezekiel 38-39. Whether that is so or not, I have nothing from the Lord about. However, it was a bit, shall I say, interesting that while I was watching the time on my phone to go out and watch the eclipse (it was so cold, I didn’t want to go outside too early) a runner crossed the bottom of my screen that the IDF was bombing Damascus after a missile had appeared over the Israeli side of Mt Hermon. The Iron Dome took it out. For some time now the “players” in the Ezekiel 38 war have been positioning in the Middle East, especially in Syria. So… It’s Time for the Awakening!!! It’s time for the Glory!!! It’s time to be vigilant, alert!!! Walking in the Light!!! Working with God!!! I’m going to ask the Copeland’s if I can have the recording of the session I taught at KCM Minister’s Conference. If I can, I will make it available to you. There was an anointing; therefore I feel it would be worthwhile to you. Love this we are looking for the manifestation of The Glory in our church!! I pray KCM releases the recording to you. Would love to see/hear it. Thank you Sister Billie for sharing your heart and insights with us. Thank you, thank you blessed Billye. I was wondering about the wolf- blood moon. You do indeed keep my hunger stirred up and keep us accurately informed. I look forward to the teaching. Thank You for your teaching and anointing that i have learned so much from you. I grew up at Happy Hill not far from Collinsville so you seem like family and telling your story is extension of my own. What exciting times we live in! We are so blessed! Thank you for sharing this! My husband and I attended the conference as well and oh! It was glorious! So rich with His manifest presence! Brenda was so shrouded in His glory when she came up to the platform I could see that it took everything in her just to stand up! Your message, Sister Billye was timely, as always, and always an encouragement to take our seat of authority and declare the Word of the Lord! The time is indeed short and we’ve been placed here for such a time as this! To God be the Glory!!! Let’s DO IT! Soon and very soon we’re going to see the King…. Hallelujah! Thank you so much Sister Billye! I had been praying over the Minister’s Conference and hovering over you in prayer for The Glory and Light of God to overwhelm you all and thanking God for the precious Gifts He gave to us Gis body. I’m so hoping to be able to hear your recording and that it will be released to us. Love and Shalom! Thank you for sharing , you are such a blessing and encouragement to me. I look forward to hearing the message. I look forward to your Wednesday’s Facebook meetings. Shalom from Little Rock, AR. Billye…thank you for your comments! I wish you had been with the Copelands these last two weeks!!! I miss hearing your thoughts and teachings with the Copelands!!!! You are surely missed here! Glory to GOD so right on time are the things, revelations and Glory for this time.. I always enjoy your blog Sister Billie, mighty woman of God, looking forward to message being released..
Can hardly wait to hear your session!!! Glory to His Name!! Thank you so much for sharing. I long to be in a place where the glory is as you and Sister Brenda described, and am looking forward to it. Please, please get the recorded message for us. I am on the call each Wednesday and am so grateful for the update and interpretation of events happening in the world and their effects on the U.S. and Israel. Praise God for you. Thank you – and have you selected the members to go on the Dianna Hagee trip to Israel? I submitted a name and am curious about the selection time. My husband and I were there for the conference. Your word was sooooo good! Thank you for sharing with all of us! You gave such a great word picture about coming back with Jesus on a white horse! In the natural I am not a fan of riding horses but the Lord dropped in my spirit that picture of us coming back with Him on a white horse and I got so excited about horses! Mine will be strong and fast because I will live each day here on this earth with purpose and dominion! Thank you! 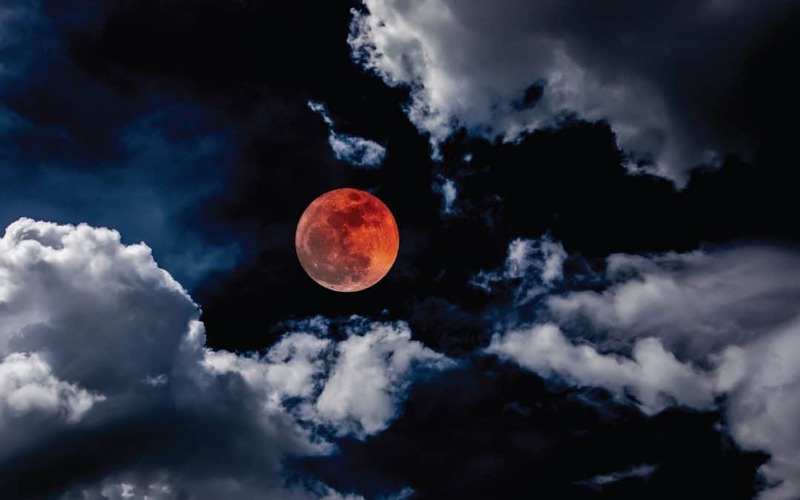 A spirit-filled counselor friend of mine showed me a picture he took of the blood moon Sunday night. When he zoomed in, I could clearly see a wolfs face but it had horns. A demon/ wolf. I was not surprised as he went on to share changes God has been speaking to him about. Just confirmation of what Sister Billye shared on Wednesday. I love all that you do. I pass it on. May God Blessings be upon you always. Thank you so much! I was unable to attend the conference this year so I am anxious to hear your session. The clouds are gathering… NY (where I live) just passed the most horrific abortion law ever; the nations are being moved into position…today’s news was that a deal between Greece and Macedonia had been reached and the country will now be called North Macedonia. I need to research this out in scripture but I would love to hear your take on this. Oh glory glory gory! I had felt a difference in the spirit, well… more like an increase in expectation, that the outpouring is now, over the past days. I didn’t correlate it to the eclipse as a sign, but oh glory glory glory! Does Billye have an idea of how soon, soon is? Thank you Billye for this update. You mentioned some of this on your Wednesday morning Prayer Call for Israel. It’s good to have it in print, too. I appreciate your insight into these things. I was aware of two Gog- Megog wars in scripture but not three. Most of all I’m thankful you keep us hungry and attentive for the glory and the coming Awakening. We watch and pray, anticipating and expectant. I hope KCM releases that recording. I’m sure we would all love to hear it. I was at the ministers conference when brother Copeland was on the platform with Mac Hammond. Brother Copeland had been talking about the combines he saw in a vision and how they started up one by one. Years ago, while attending Rhema, I went through Virginia in route to the coast of North Carolina to join my family for a beach vacation. I had been learning how to be led by the Spirit of God and was seeking to employ what I’d learned during the trip. In Virginia I felt drawn to Lexington which is home to the Virginia Military Institute and Washington and Lee University which is next to it. Upon strolling the campuses I noticed a statute of a man who I thought was General Robert E. Lee since it was near Lee’s Chapel. When I arrived at the statute, I saw that the plague read, “Cyrus McCormick”. Since I was raised in Virginia, I remembered from my Virginia history that Cyrus McCormick was the inventor of the reaper (the forerunner to the modern day combine). As I gazed at the beautiful, majestic mountains surrounding Lexington, it “dawned” on me what it all meant. The Virginia Military Institute represented those who would be trained in the Sword of the Spirit which is the Rhema Word of God. Washington and Lee University, next to it, is an institution that groom students for careers in law that “intercede” for their future clients. This represents those skilled in the area of prayer. When a person becomes trained in the Word of God and prayer, they become a MIGHTY HARVESTER FOR GOD among the nations! ( as you know mountains often represent nations in scripture) I sensed in my spirit that God would raise up those from that place that would become mighty reapers of the end time harvest. YEARS LATER, as God directed my path, I became acquainted with the Hammond ministry. They blessed my with their rich teaching and their example in ministry and prayer. One day I was browsing the internet and I went to their church’s website. As I read the bio on Mac Hammond, it said, GRADUATE OF VIRGINIA MILITARY INSTITUTE!! So you can see, when he stood by brother Copeland at the convention, it was a confirmation to me that this is truly the year of AN ABUNDANT HARVEST! Thank you for the update l lt’s always a BLESSING. I wasn’t able to make the minister conference but l did place my order for the DVD’s this week. It’s always a powerful meeting. Looking forward to watching them when they arrive. Hello Billye thanks for the update. I was unable to be at the meeting this year, but l know in my heart that God Spirit move mightily. I look forward to receiving my DVD. Would love to hear your meeting! You and your anointing are such a blessing! Look forward to the teaching so hungry for the Spirit! I’m looking forward to the session from the minister’s conference….thank you for the update. Thank you Billy for sharing for you have so touched millions and were chosen to unwrap the gifts in all of us. Do pray that we get the opportunity to hear your message from the conference. So enjoy your Blog. May Revelation Glory flow wherever you go. Ok Sister Billye, You got me all stirred up in anticipation of what you taught at the Minister’s Conference, now I cannot wait to see what the Lord had you to share. As you well know these are not emotional events so many things are happening so quickly my goodness I just get so curious and full of anticipation to see how God’s plans are unfolding all around us . How can anyone sleep with this excitement? It’s like the more a person would seek after the things of God is the more the selfishness of our lives disappear so God can use us. Please don’t delay in asking for the message so you can share it. Thank you for thinking about us. Isn’t it interesting that the US is being pulled out by the President? Thank you. What a treasure you are to me, and to the Body of Christ. The encouragement you offer carries a strength that is so necessary. Oh how I yearn for the strength of fellowship from like minded leaders. I look forward to hearing the teaching. So looking forward to receive your message from the KCM Mininster’s Conference! Thank you for your blog Sis Billye and for all you do to keep us informed and be on par with the things of the spirit both in prayer and in our walking in the light. Barak Billye. Thank you for your report on the recent KCM Minister’s Convention. I look forward to obtaining a copy of what you shared. clergy we need to repent. I would love to hear the message God spoke through you. Lord come again in great glory and power. I love your Blogs, sister Billye! Myself and some friends were wondering about that blood moon, so this information was informative and exciting to us. Thank you so much and yes,JESUS IS LORD! Thank you Sis Billye. We learnt so much from your teaching with Sis. Gloria on BVOV on the Glory of God. Look forward to hearing your teaching at the KCM Ministers Conference. We value you dear folk as gifts to the church and we love you. Thank you for the information on the eclipse. I wondered what significance it had. May God richly bless you and your family. You are such a great blessing to all of us WWP’s.